Our Water Conservation Decals are FAR HIGHER QUALITY than decals available from other sites on the internet. Our Water Conservation Decals do not have a laminate topcoat... Our Water Conservation decals have a screen printed topcoat, so the topcoat will never be damaged by wiping. In fact, the topcoat on our Water Conservation Decals is so impervious to solvents that it can be cleaned with gasoline! Our Water Conservation Decals have at least double the adhesive when you buy the vinyl decal and four times the adhesive when you buy the polycarbonate decal...the adhesive on our Polycarbonate Water Conservation Decals is the best adhesive made. It is the highest quality 300 LSE 3M Glue, which will adhere to difficult surfaces. Our Polycarbonate Water Conservation Decals are $10 for one, $25.47 for three, and $59.50 for 10 decals, with FREE shipping. Our Vinyl Water Conservation Decals are $3.00 for one, $8.00 for three, and $20.00 for 10 decals, with FREE shipping. PLEASE SPECIFY IF YOU WANT 10 MINUTE SHOWER, 5 MINUTE SHOWER, OR 3 MINUTE RINSE DECALS. 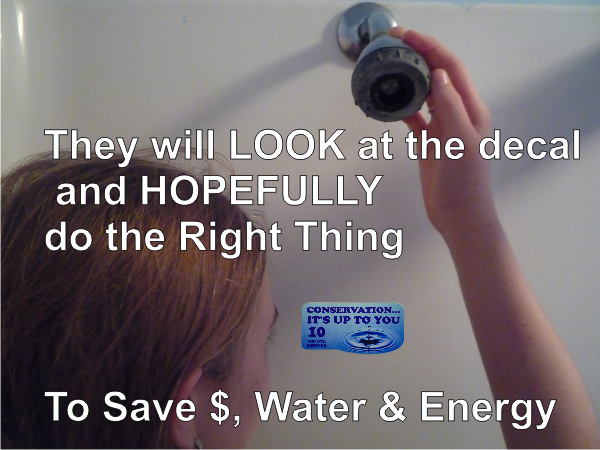 * Our Water Conservation Decals will save you big money on energy to heat the water and the water itself. 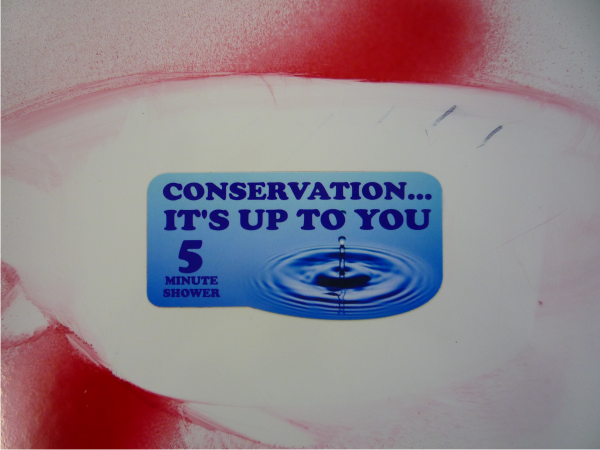 * Our Water Conservation Decals are so attractive, that people will be compelled to look at them and be reminded to do the right thing. * Our Water Conservation Decals are for private homes, dorms, bed n breakfasts, motels, hotels, truck stops, and any place people take showers and run up $$$$$$$$$ and waste precious water and energy.